For 50 years as an independent record label, Malaco Records defines southern rhythm & blues, soul, and gospel. "The Last Soul Company" started in the early 1960s with college students Tommy Couch and Wolf Stephenson booking bands for fraternity dances at the University of Mississippi. In 1967 the company opened their Jackson, MS based recording studio in a building that remains their home. Experimenting with local songwriters and artists, the company began producing master recordings and licensing the recordings with established labels for national distribution. Between 1968 and 1970, Capitol Records released six singles and a Grammy-nominated album by legendary bluesman Mississippi Fred McDowell. Deals for other artists were concluded with ABC, Mercury, and Bang. In 1970, producer-arranger Wardell Quezergue who made his mark with New Orleans stalwarts Fats Domino, Professor Longhair and others, offered to supply Malaco with artists in return for studio time and session musicians. He brought five artists to Jackson in a borrowed school bus for a marathon session that yielded two mega-hits -- Jean Knight's "Mr. Big Stuff" and King Floyd's "Groove Me" which sold over two million copies on the way to #1 on the R&B charts and #2 pop. In 1975, Malaco released "Misty Blue" by Dorothy Moore which earned gold records around the world, peaking at #2 R&B and #3 Pop in the USA, and #5 in England. This was followed by thirteen chart records and five Grammy nominations for Moore. Then in 1979, Anita Ward’s disco smash “Ring My Bell” reached #1 on the Pop and R&B charts selling 10 million copies worldwide. Freedom’s "Get Up and Dance" hit the New York club scene in 1979, and starting with Grandmaster Flash became one of the most sampled records of all-time. ZZ Hill’s blues classic “Down Home Blues” was released in 1982. The LP stayed on the Billboard rhythm & blues charts for a phenomenal 93 weeks in 1982-83 while selling half a million copies -- an unprecedented mark for a blues album. Its success proved that there was still a substantial audience for the blues, and its production style set a standard for much of the music that followed. This achievement along with those of artists Johnnie Taylor, Denise LaSalle, Little Milton, Bobby Blue Bland and others further established Malaco as the center of old-time blues, soul and southern R&B. In 1985, Malaco purchased the Muscle Shoals Sound Studio, label and publishing company. The studio and its fabled rhythm section “The Swampers” are credited with gold records by the Staple Singers, Paul Simon, Aretha Franklin, Bob Seger, Rod Stewart and Wilson Pickett to name a few. The publishing company contained hits like "Old Time Rock and Roll" and "Torn Between Two Lovers." The next year they purchased the gospel division of Savoy Records. The acquisition brought a vast catalog of classic recordings dating back decades, including albums by Shirley Caesar, Rev. James Cleveland, Albertina Walker, The Caravans, Inez Andrews, The Georgia Mass Choir, and The Florida Mass Choir making Malaco the preeminent black gospel company in North America. The company also continued its steady, prudent expansion, purchasing half of the Memphis-based distributor Select-O-Hits, and making inroads into the urban contemporary, jazz, and contemporary Christian markets. Many Malaco hits, including “Down Home Blues,” “The Blues is Alright,” “Someone Else is Steppin’ In,” “Members Only,” and “Last Two Dollars” have become staples in the repertoires of blues bands across the country. Other Malaco artists include Latimore, Marvin Sease, Bobby Rush, Soul Stirrers, Jackson Southernaires, the Williams Brothers, the Sensational Nightingales, the Truthettes, the Angelic Gospel Singers and the Mississippi Mass Choir. 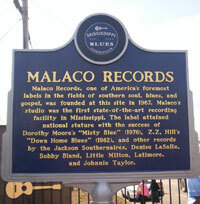 Malaco Records, considered one of America’s foremost labels in the fields of southern soul, blues, and gospel, was founded at this site in 1967 and is on The Mississippi Blues Trail. The Blues Trail markers tell stories through words and images of bluesmen and women and how the places where they lived and the times in which they existed–and continue to exist–influenced their music. The sites run the gamut from city streets to cotton fields, train depots to cemeteries, and clubs to churches. We have a lot to share, and it's just down the Mississippi Blues Trail.